Whether you choose to travel with GO Transit or UP Express, we have many options to take you to Pearson Airport and Billy Bishop Airport! 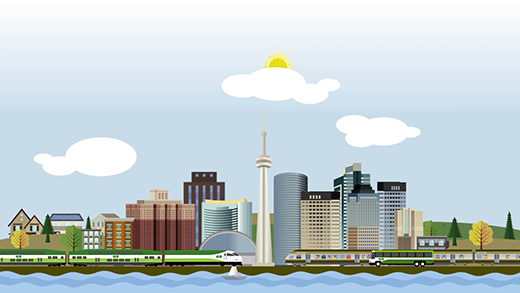 When transferring from a GO Train to an UP Express train, you’ll need to pay two separate fares – one for each train. And if you’re using PRESTO, remember to tap on and off both times. To learn more visit UP Express. Routes 40 and 34 run hourly on weekdays and weekends, and every 30 minutes during weekday rush hours. Looking to take GO Bus route 40 or 34? Click here for your schedule. If you’re flying from Billy Bishop Airport, you may take either a GO train or bus to Union Station. From there, Porter Airlines offers free shuttle service to the airport ferry or tunnel. You can catch the shuttle outside of The Royal York Hotel’s western entrance, on York street, near the north-east corner of York and Front streets. The shuttle leaves about every 10 minutes. Don’t worry, we’ll do our best to accommodate your luggage. Most GO buses have under-floor luggage compartments. You also find luggage storage on GO and UP Express trains.